Our Linen Cream 80lb (216gsm) heavyweight Desktop Publishing Supplies Brand business card paper is both Inkjet and Laser compatible. The Cream Linen business card stock may be too heavy for some laser printers but will work great on most inkjets. Our blank business cards are created with the standard layout and are compatible with all major software. 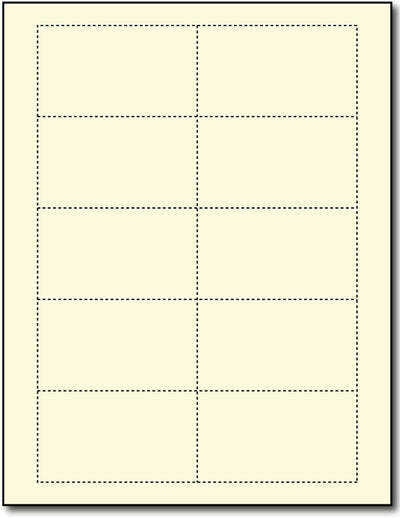 These blank business cards are microperforated and are printable on both sides. Our blank business cards are made from an 8 1/2" x 11", 80lb (216 gsm) cream linen blank business card stock. Linen stock has a textured surface. 10 blank business cards per sheet.